Couchsurfing is about paying it forward. When you host a couchsurfer, you expect nothing from them, and they expect nothing from you other than a couch on which to crash (hence the term “courchsurfer”). The only expectation is that the couchsurfer will then open up his or her home when he/she’s able. But in our experience, the kindness and hospitality from couchsufring hosts as well as couchsurfers always leaves us amazed at how much good there really is in the world. In our world of 24/7 news, social media wars, and headlines that compete for our attention, it seems the more gory and disgusting a story is, the more airtime it gets. The result is a general feeling of mistrust and fear-mongering about a world that’s really not nearly as bad as it seems. Yes, there are a lot of tragedies in the world. Yes, there is a lot of violence in the world. Yes, there are people who take advantage of others. But there is also a great deal of kindness in the world. There is also a great number of people who genuinely care about others, whether they know those others on a personal level or not. And encountering this kind of kindness is what Couchsurfing is all about. An even less-known group of kind travellers is the group that offers their backyards or indoor accommodations for cycle tourists. Warm Showers is a website very similar to Couchsurfing, but it caters specifically to cycle tourists. In our eight years as couchsurfing hosts, we’ve welcomed a variety of people who have enriched our lives with their stories, experiences, and kindness. We once hosted a group of young cyclists who teaches school children about a sustainable lifestyle (and walks the talk—or cycles the route, as it were—by going from school to school by bicycle). We’ve hosted hitchhikers from Lithuania, a lovely girl from Poland, a girl from Portugal who lives in England, a wonderful rock band from Montreal, and I could keep going. In our more recent experience as Warm Showers hosts, we’ve welcomed cross-Canada cyclists and world-touring cyclists in our home. Each one of these wonderful people had amazing travel stories to share, and our philosophies of exploring the world and being kind to others while doing so matches up with theirs. We’ve hosted vastly different people from vastly different backgrounds, but our love for travel unites us in a way that is difficult to explain in words. This past weekend, we welcomed a man and his son, and we enjoyed their company very much. They enjoyed the sights Kingston has to offer on their own time, and also joined us for Artstravaganza at the Tett. K-girl and the son, who is 9 years old, got along wonderfully, and K-girl was thrilled to finally have a couchsurfer with a kid here (all our other guests did not have kids or had grown kids). Hosting in our home way back in 2008 was just the beginning. After hosting couchsurfers for 6 or 7 years, we set out on the road on bicycles with our kiddos, and experienced everything that couchsurfing has to offer. As couchsurfers, we were blessed to stay with a wonderful host in Oshawa, who made us feel like royalty. He not only cooked us hot breakfast, lunch, and dinner, but also gave us a ride to the store to pick up some much needed gear for our trip. None of this is a requirement as a couchsurfing host, but this is the sort of kindness we have found on our travels. There are a tonne of people out in the world who want to help people simply for the sake of helping people. We also stayed with a great host in Woodstock, whose home was wonderful, and whose dog was a great companion, too. As Warm Showers guests, we stayed in a wonderful home in Cobourg, with a couple who shared their biking stories and helped us to feel more than welcome when we needed to stay an extra night. We stayed with farmers who also gave us a ride to the store when we needed to replenish our food supply. The time shared with these fellow travellers are memories we will cherish for a long time to come, and in my opinion, money cannot buy similar experiences. All of our experiences staying with or hosting complete strangers have been wonderful. We always learn something and are touched by the kindness and openness of strangers. What unites us and helps us to be comfortable in each other’s company the minute we meet is this love for exploring this wonderful world in which we live. Travelling opens the doors for so many opportunities that show us the world is still, indeed, a good place. That there is still a lot of good in our earth. That despite what the headlines may say, there are still wonderful things happening each day, and people do still care deeply about others whom they may have never met. And when you aren’t travelling, welcoming travellers into your home helps you experience the world while staying put. We’ve enjoyed our experiences hosting those who choose to wander, and we’ve enjoyed our own wanderings, too. We are looking forward to many more of these experiences. As J.R.R. Tolkien said, “not all who wander are lost.” Sometimes it’s precisely by wandering that you find yourself – and meet some wonderful people in the process. Want to learn more about the “crazy things” we do while raising kids? Sign up for the mailing list below! Next Next post: I stopped saying “I can’t afford it.” It’s liberating. I had couchsurfing account but was not able to maximize and use it. I guess next time, I will check it and try to use for my next travel plans. I have never heard of anything like this before. Do you really stay on couches or do people typically open up spare rooms or beds as well? When you sign up for an account on couchsurfing.com, you fill out your profile, where you explain what kind of accommodations you have available. For example, mine states that our guests will have a shared space with the children during the day, and privacy at night, as they stay in the basement, which is the children’s play room. We have a queen size air mattress for our guests, but when we host several guests, some might need to stay on the couch or floor – this was the case when we hosted a troupe of 10 cyclists several years ago. The expectation is a couch, but many times you’ll be pleasantly surprised with a lovely bed or private room. When you look for a couchsurfer to host you, you can look at their profile to see what kind of accommodations they provide. If you prefer not to sleep on a couch, you can look for the ones who have beds available. Do you think you might give it a try? Couchsurfing is a wonderful way to travel. It’s not just about saving money, it’s about travelling and seeing what real life is like in the places where you visit – for example, our couchsurfing guests get to experience how one family lives in Ontario. Hotels can be great, but I like the personal touch that travelling this way provides. 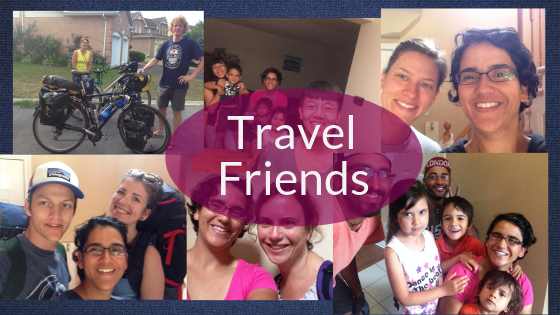 Travel with friends or family is always an adventure! If you go to Madrid, be sure to write a blog post and link back to it here – I’d love to know more! Definitely a money saver for those who want to travel. It can be so great when we help each other out. Life is certainly a journey. And you can meet some amazing people all along the way. I would be afriad to have complete strangers in my house. More power to you though. What a great idea of travelling. Atleast you had fun. What an interesting way to travel.I’ve never thought about it and I bet it’s a lot more relaxing when you know the person.